The first breakout session I attended today was “Advanced Technology Brings Ancestors to Life” by Patricia Moseley Van Skaik of the Public Library of Cincinnati & Hamilton County. She focused her talk on a panoramic daguerreotype image of the Cincinnati waterfront taken in 1848. It is considered to be the oldest photograph of urban America, including steamboats, storefronts, and more. You can learn more about the image here. The Cincinnati daguerreotype panorama is actually pieced together from eight separate images of the shoreline. The assembled image is more than seven feet long. Here is another site with information about the image. Many of the buildings in the image are no longer there, but researchers studied the photos in 1947, when many were still standing. At the time, they used magnifying glasses to see leaves on the trees, determining the season, and used other clues to determine that the year the photo was taken was 1848 (evidence of drought, etc., confirmed this date). Names of the boats in the water also helped date the photo. Fast forward to today and Eastman House made hi-res images of the daguerreotypes that allowed for closer inspection. They stitched the images together to create the panorama available at the links above. They didn’t stop there. Using microscopic images, they were able to determine it was 1:50 p.m. by zooming in on a clock tower in the photo. They discovered signs on the buildings and were able to read them. The level of detail available upon close inspection of the original images is quite impressive. Taking the information from the signs, researchers then turned to census records, deeds, city directories and more from that time to learn more about the store owners and their businesses. They also learned about some of the residents of the buildings as well. Enhanced images and detailed information will be online later this year. The crew working on this project hope to hang the daguerreotype for public display once again. It has been down for conservation work. I attended the 2010 Association of Independent Information Professionals conference in Cleveland, Ohio, this past weekend (read my recap here). The conference hotel was located directly across from two important Cleveland landmarks: Progressive Field (where we watched the Indians lose to the Twins) and Erie St. 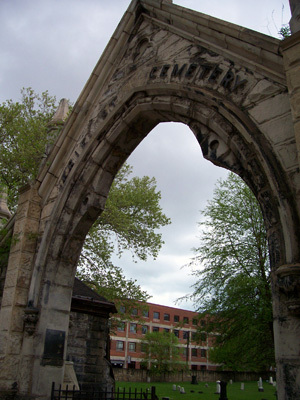 Cemetery. 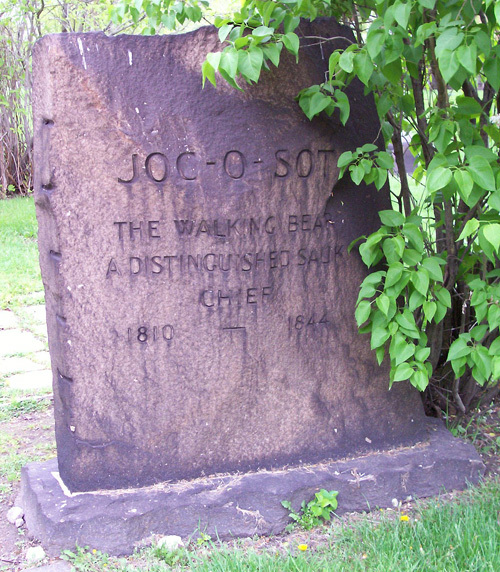 One of the stones in the cemetery is for Joc-O-Sot or Walking Bear. 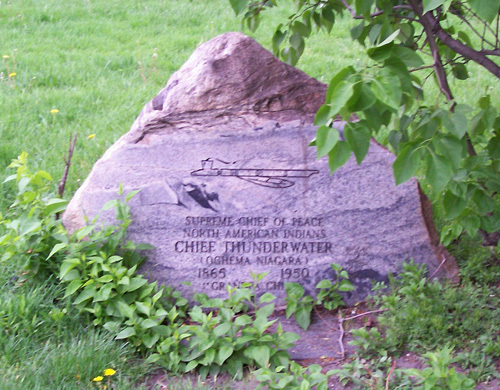 Next to his stone is that of Chief Thunderwater. Both earned names for themselves by participating in theater acts and Wild West shows. You can see Amalia and Carry listed in the census — presumably they are the Amelia and Carrie listed on the stone. Their birthdates match. 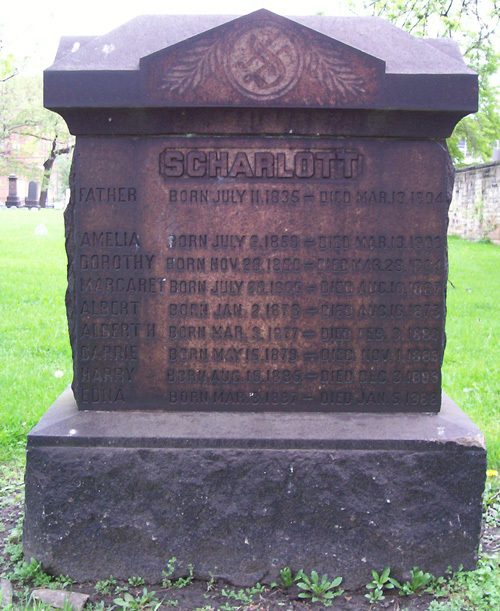 It’s somewhat comforting to know that after all that loss, some of the Scharlott children survived. And now we know their parents’ full names as well. As to why the mother, Anna, isn’t included on the stone, one can guess that she survived her husband, remarried and is buried with the subsequent husband. That’s another question for another day.